They must be stopped, punctured and brought in for questioning. 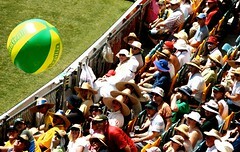 The Fun Police at the Gabba have been having a ball; harmless fun is now considered dangerous, or rude, or provocative. It has been the one blight on this Test, so much so that the Barmy Army have boycotted out of protest; their bugler was ejected and they’ve been segregated to nullify their “effect”. This entry was posted in Cricket and tagged ashes, barmy-army, beach-balls, brisbane, fun-police, gabba, the-ashes. Bookmark the permalink.